Memorial Day nicely illuminates key aspects of Catholic spirituality – of our life in but not of the world. 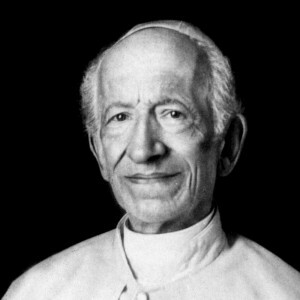 On the one hand, the Catholic cannot wholly entrust himself to any earthly nation. Our “alien allegiance” has sometimes been misunderstood, as if the Pope were just a foreign sovereign. But rather, our only true sovereign is Christ the King, our true homeland is heaven, and our true nation is the Church: “You are a chosen race, a royal priesthood, a holy nation, a people for God’s own possession, that you may show forth the excellencies of him who called you out of darkness into his marvelous light” (I Peter 2:9). There’s something lost in translation, but the real heart of Vatican II’s understanding of the Church is the phrase “people of God.” But “people” here, Latin populus, is not the plural of “person”: in Lumen Gentium, we’re not a bunch of individuals who are each a “person of God.” The “people” is a collective – connected with Peter’s words “race” (genos, like genus) and “nation” (ethnos). The Church is our country, our true ethnicity, and we are meant to see ourselves as part of that country before we are part of any other. On a day like Memorial Day, this shows itself, in one sense, negatively. (Don’t mistake me – I’m getting to the positive!) As Christians we can never submit ourselves wholly to this earthly nation, or its moral mishaps. My grandfathers fought in World War II, and I am grateful for them today. On balance, they did much good. But we must never forget that the Church (our true nation) unequivocally condemns our earthly nation for targeting civilians, not only at Hiroshima and Nagasaki, but also at Tokyo, Dresden, and many other cities we carpet-bombed. That must not stop us, however, from honoring our soldiers on Memorial Day. What most defines a soldier is not that he kills, nor that he carries a gun. What most defines a soldier is that he puts his own life in harm’s way to protect his homeland – and that he submits himself to the higher authorities of his country in so doing. A Christian soldier cannot be obedient when his earthly authorities contradict Christ the King. But outside of those circumstances, his obedience is the sign that he seeks not his own good, nor his own pride, but the good of his country. That he lays down his life for his friends. This is among the most noble things a human person can do. 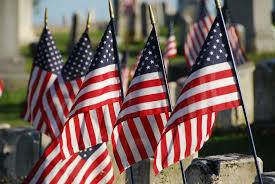 A soldier goes to war out of gratitude for his country; Memorial Day encourages us at home to imitate that gratitude. The soldier recognizes that his homeland is worth giving his life for. For the beauty of the land, but even more for the beauty of his people. A truly Christian soldier cannot, of course, think that his people are without sin. But that doesn’t stop him from loving their music, their food, their leisure, the things they build, their ways of relating. My great-grandfathers and grandfathers went to the First and Second World Wars in regiments from Wisconsin. I think we miss the nature of patriotism if we think they only fought for the broad idea of America. They sang, till their death, almost bizarrely patriotic songs about their home state, and their home city. It was those details they fought for. They fought for home. When the commandments – and the example of Jesus – tell us to honor our father and mother, they remind us that home itself is a gift from God. We are not of this world, and no earthly country can ever claim ultimate sovereignty over our hearts. But our love of God itself demands gratitude for the people and places we belong to. This is the deepest meaning of laying down our life for our friends. To realize that God didn’t make us to be radical individuals, but to love the people around us intensely, so that we would lay down our life: for Wisconsin, New Jersey, Rhode Island, or whatever our earthly home may be. Think of the soldiers in your family’s history – and let them lead you to deeper gratitude for the home God has given you. On Wednesday my family and I were dreadfully sick, and I missed the opportunity to write a post for Our Lady of Guadalupe, whose feast was Thursday. I offer one now. I presume all my readers know the story. In the early days of the mission to the Americas, things were not going well. 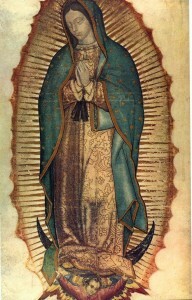 Mary appeared to the peasant Juan Diego in the image of an Aztec princess. She imprinted a miraculous image of this apparition on his tilma, which remains miraculously preserved to this day. The image served as a major point of conversion for the Indians throughout the Americas, and remains a key part of the North and South American Catholic heritage to this day. I want to make just two points about Our Lady of Guadalupe. First, she shows us that God is truly with us. The central point of the image is that Mary appears not as a European, but as an Indian. God became man in a particular time and place. Jesus spoke a particular language, with a particular dialect. His skin, eyes, and hair color showed him to belong to a particular race (though, amazingly, most of us aren’t sure what that was). His disciples were known by their funny accents. I was not there. But the point of the Incarnation was not that Jesus came just for that time and place, but that he came for all times and places. That he embraces the particular, so that I find him in the funny accents where I live, my particular culture, my time in history. Jesus did not banish history, but embraced it, in all its particularity. Mary stands for the humanity of Jesus. It is her particularity that he embraces. And so Mary is the one who appears to the Indians as one of them: to say, yes, Jesus was born of woman not to alienate you, but to embrace you. God is so close to you in Jesus that you can count his mother as one of you. It is your world that God embraced in the Incarnation. We live in an age of American Empire. That’s not necessarily a bad thing, if rightly embraced. Empires can bring peace, as the Roman Empire did in the time of Jesus. And our Empire, in some ways, is particularly benevolent, or at least has the opportunity to be that way. 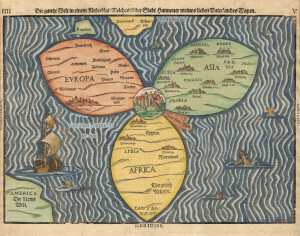 But to be a truly benevolent Empire – or anyway, a truly benevolent America – it does us well to remember that we actually aren’t the center of the world. Jerusalem is. 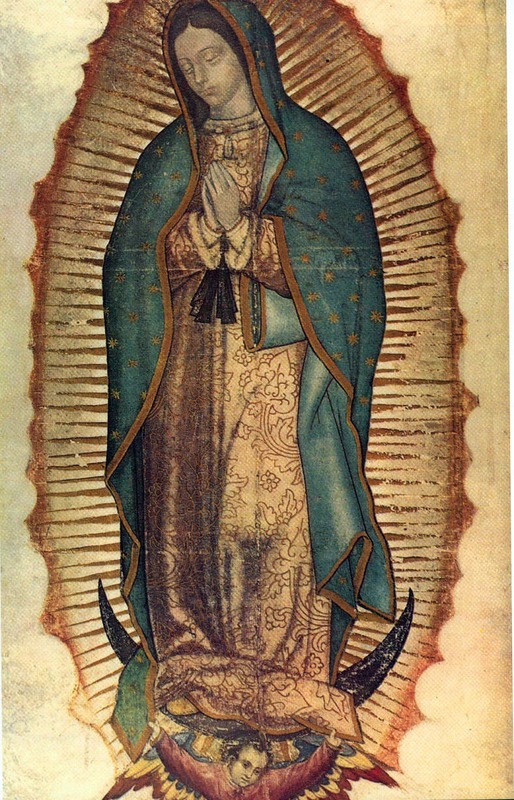 Our Lady of Guadalupe reminds us Americans that we belong to this strange Atlantis. Not the center of the world, but its farthest reaches, its strangest and youngest outpost. Not Australia: they are the farthest reach of the old world, the normal world! It does us well, first, to see that Jerusalem really is the center, that we all measure our distance from Jesus. Second, to know that the three old continents are all due their respect as the normal world, the ancient world, the respectable world. America has great young energy: but respect your elders! And third, to remember that the “Americas” are one. The Europeans (including the Vatican) count us as one continent. And really, we do well to see that we are all in this together: we, the youthful nations; we, the land of the Indians and the slaves; we, who might be the future, but shouldn’t forget the past: especially the sacred history of Jerusalem, the center of the world. How do you see America forgetting its youthfulness? 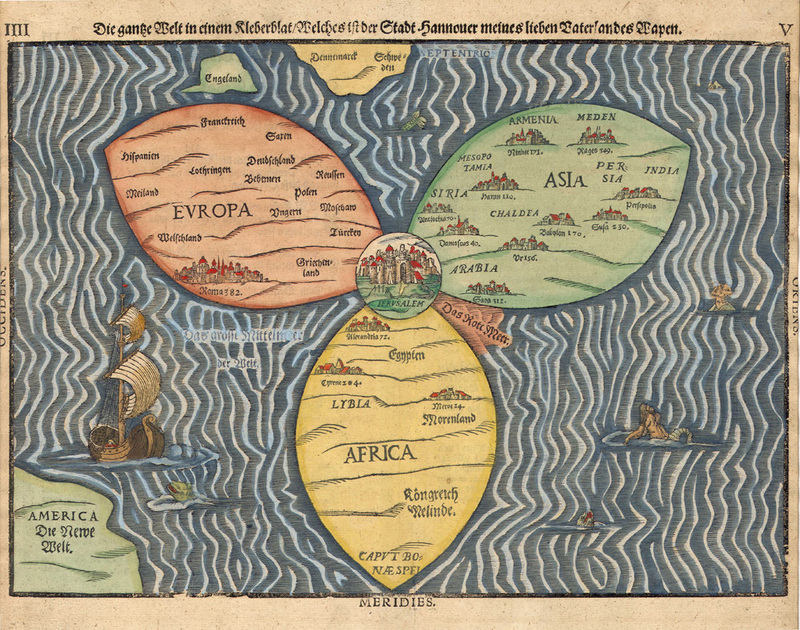 What could we learn from seeing ourselves as the antipodes?